It was enthusiasm for the folkloric-lyrical character of the Norwegian's music that prompted Lea und Esther Birringer to immerse themselves in the early work of Grieg, from where they went on to explore the emotional diversity of the later compositions of Liszt and Franck. "This musical adventure is an absolute must for any chamber music aficionado." (Pizzicato). The dynamic duo of sisters also draw the energy for their shared performances from the experience each of them has derived from her solo career. Violinist Lea Birringer "knows exactly what she wishes to convey" ("DrehPunktKultur" cultural magazine). Her musical training, which includes a spell at Salzburg's Mozarteum, forms the basis for numerous awards and prizes which have taken her to major concert venues such as the Berliner Philharmonie, Hamburg's Laeiszhalle, Munich's Gasteig, Vienna's Musikverein and the Salzburg Festival. "Her performance is much more that of a musician than simply that of a violinist," (DrehPunktKultur). Her sister, pianist Esther Birringer, generates equal enthusiasm with playing which is both sensitive and exciting. Her initial prize in the "Jugend musiziert" competition for young musicians in 1999 was only the first of many awards. This "bundle of energy" (the "Weißenburger Tagblatt" newspaper) has played with orchestras such as the Munich Symphony Orchestra, the Berlin Radio Symphony Orchestra, the Brandenburg State Orchestra Frankfurt (Oder) and the Deutsche Streicherphilharmonie. In addition to Karl-Heinz Kämmerling, Esther Birringer's artistic mentors include Pascal Devoyon, Cécile Ousset and Arie Vardi. "Sisterhood is powerful. The Birringers project the radiant joy of the Grieg Sonata, shadowed by Liszt’s moving introspection, and a justly proportioned, elegantly standout performance of Franck’s evergreen Violin Sonata. [...] Chez the Birringer sisters one has the sensation of hearing it for the first time. Apart from a smiling sweetness in phrasing, a fluent alertness to melody, the Birringers share a certain punctilio, a keenness of touch—a crisp articulation—on the keyboard met by dead-center intonation on the violin making for a scintillance which eschews all slurring, smudging, or impatient approximations. These virtues loom up close and palpable in immediate, detailed sound, though the violin is, of course, primus inter pares. Here are performances satisfying, gratifying, to live with and enthusiastically recommended." "The sisters from the Saarland interpret a well-balanced programme with passionate temperament and delicate musical harmony. In the Grieg Sonata, the juxtaposition of academic forms and folkloristic tones is assessed with precision and balance. In the exuberant fin-de-siècle romanticism of the Franck Sonata [...] the cyclical elements of form are elaborated with rare clarity. The ascetic sound world of the late Liszt is beautifully captured and forms an effective contrast between the two weighty main works." "An intelligent program and fine performances make this an attractive proposition even in a highly competitive field." "With elegance and dedication, the duo interpret a piece of Grieg’s, which we follow enthralled, as if hooked on a crime thriller. […] Even though the sisters have already delighted listeners with their recently released album Lifelines, live they now take their performance up a notch. In the Birringer family, romanticism doesn’t mean to radiate bliss, but to show what a piece is actually all about. Esther wonderfully lets off steam on the piano, while Lea seemingly casually unleashes fireworks on the violin. […] In any case, the audience are blown away." "The sisters Lea Birringer, violin and Esther Birringer, piano, provided emphases that must be taken seriously. Lea Birringer possesses a powerful yet slender sound, as well the virtuosity required for Grieg’s striking and seldom-heard Violin Sonata No 1 in F major, op 8 and Wieniawski’s Polonaise de Concert D major." "The Birringer Duo’s disc is a terrific, engaging release"
"In Grieg’s F-major Violin Sonata no. 1, the duo’s exacting technical control is paired with a strong, collective poetic sensibility that gamely draws out the music’s sometimes halting, often dissimilar personalities. Their playing is full of character, especially in the folk-like sections: the trio of the middle movement is full of vigor and the many Scandinavian fiddle gestures of the finale hold nothing back. The Franck Violin Sonata that closes the album is similarly all-in. This is an interpretation that’s fully attuned to the score’s turbulent passions – the middle movements, with their wild contrasts and shifts of mood, color, and textures, burn particularly hot – but one that always manages to keep a cool head about itself. Textures are clear (a big plus in this busy piece), the score’s transforming structure clearly delineated, tempos consistently well-judged, and the playing pulsing with rhythmic energy. Overall, this is a terrific, engaging release that offers the excitement of a live performance with the perfection of execution and acoustic you only get from a studio recording; in other words, the best of both worlds. Don’t miss it." "The Liszt pieces are not exactly over-recorded, and the pair (Lea and Esther Birringer) approach them with style and the full-blooded commitment they bring to the entire disc. They sound like instinctive, physical players, and they’re very evidently on the same wavelength as regards the music’s ebb and flow. There’s a winning freshness about the way they tackle the Grieg in particular, bending into the sweep of a melody. Violinist Lea has an enjoyably springy way with a dance rhythm." 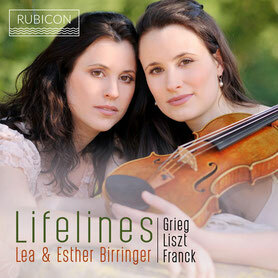 With works by Grieg, Liszt and Franck, sisters Lea and Esther Birringer play a seemingly conventional programme. But nevertheless, there is much to discover! A smart selection, according to Jörg Lengersdorf. "Even simple airs boast stunningly inspired moments of chamber music interplay. […] Yet many chamber music fans may well still have a space on their CD shelves, and this one is definitely worth discovering." "Luckily, sisters Lea and Esther Birringer do not count among those musicians who are exclusively fixated on flawless notes. They seek personal, human access to these three composers. The most jubilant is their encounter with Grieg’s youthfully passionate sonata, whose zest for life and joie de vivre are clear from the very first note. The opening sparkles like the first rays of sunshine of the day, and the leisurely buildup is completely natural and unforced. The middle movement is also magical […] Liszt sounds mature and reserved, but no less expressive and oppressive too." "With the greatest degree of precision"
"Worthy of especial praise are their intimate manner of playing and the tonal beauty. And of course it goes without saying that the whole is sustained with the greatest degree of precision." "A musical force to be reckoned with"
"Anyone as good-looking as Lea and Esther Birringer might occasionally encounter reservations in the classical music scene, which is becoming increasingly focused on outward appearances. These reservations are wholly unjustified, of course, because the two beautiful sisters from Saarland are a musical force to be reckoned with. Both of them also perform as soloists, but it is precisely as a duo that they captivate audiences with their technical ability, profound musicality and – above all – perfect harmony. Atmospherically dense, they play the two rarely heard Liszt Elegies, which form the centrepiece of their new CD. And they also artfully make the other two pieces, Edvard Grieg’s First Sonata and César Franck’s famous Sonata in A Major, their own: Their Grieg is poetic and subtle, and their rendition of Franck shows a real fire burning within them." "On this CD, the sisters Lea and Esther Birringer show just how vivaciously, excitingly, spontaneously and at the same time delightfully, homogeneously and artistically chamber music can be performed. I have to admit that I have never heard Grieg’s First Violin Sonata rendered so beautifully, in such dialogue and so full of atmosphere as on this recording. 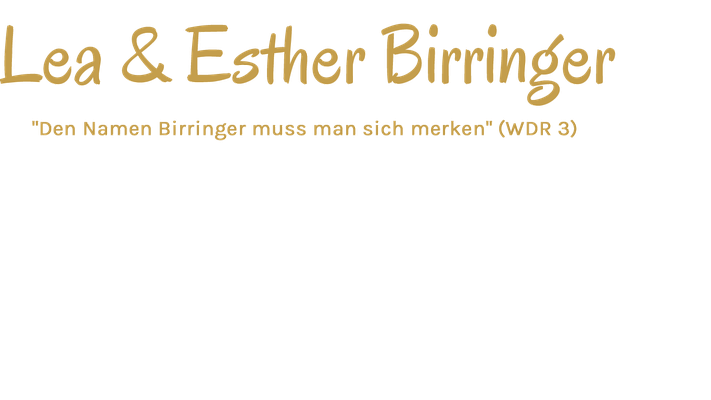 Lea and Esther Birringer prove to be an ideal team, as first-rate musical partners. Their dialogues flow with such wonderful naturalness and the virtuosity resulting from this naturalness is captivating, but never excessive. The two Elegies by Franz Liszt are also perfectly balanced and show the Birringers to be very clever and above all highly competent musicians. The atmospheric density and simply wonderful playing make Franck’s Violin Sonata a real jewel. At each point, the listener has the feeling that the music just has to sound like this and that Lea and Esther Birringer’s rendition is the only possible interpretation. In addition to these interpretational moments of bliss, the two performers also display a breathtaking technique that makes listening a real pleasure, especially as the excellent recording technique presents Lea and Esther Birringer’s interpretations and musical talent in an optimal light. This musical adventure is an absolute must for any chamber music aficionado."